Trump Warns Putin That "Russia Has To Get Out" Of Venezuela, "All Options Are On The Table"
Days after Vladimir Putin sent military planes and 100 troops to an airport near Caracas over the weekend, on Wednesday President Trump warned Russia against involvement in the Latin American nation, telling reporters in the Oval Office that "Russia has to get out" amid U.S. efforts to back opposition leader Juan Guaido. 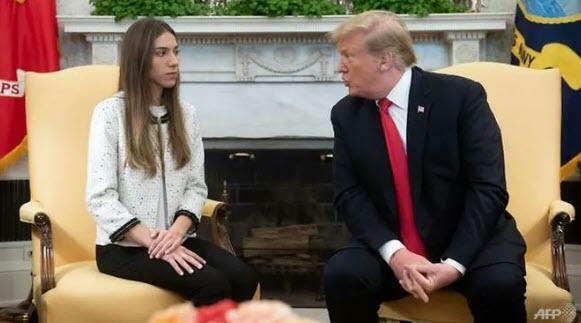 Trump was meeting with Fabiana Rosales, the wife of Juan Guaido, who has been recognized as the legitimate leader of Venezuela by the US and various western nations, even as both Russia and China still endorse only the regime of Maduro. Asked if he'd communicated that message to Russia through one of his representatives, Trump said "they know very well." Moments before Trump spoke, VP Mike Pence called on Russian President Putin to cease talks with Maduro and said Russia’s military move was "an unwelcome provocation", clearly failing to grasp the absurdity of what has become a soft US-backed presidential coup (and one which based on reported on the ground has lost most of its recent momentum). To underscore that the US still hasn't given up imposing control in the country with the world's biggest oil reserves, Trump said “all options are on the table,” language he has repeatedly used when asked whether he’s considering U.S. military intervention against Maduro. "Past administrations allowed this to happen," Trump said. "I’ve inherited a mess between North Korea, and all of the problems we have all over the world, the entire Middle East and Venezuela. These are things that never — they never should have happened. A Venezuelan Information Ministry official told Bloomberg that the visit was to perform maintenance on Russian military equipment the nation had purchased. On Monday, Secretary of State Michael Pompeo called his Russian counterpart, Sergei Lavrov, warning that the U.S. and its allies “will not stand idly by as Russia exacerbates tensions in Venezuela." In response, Lavrov told Pompeo that the U.S. is fomenting a “coup d’etat” against the Maduro government that violates the United Nations charter. For those who note the uncanny similarities between the Venezuela scenario and both Syria and Cuba (and its missile crisis), you are 100% correct, although how the current geopolitical showdown between the two superpowers ends is still anyone's guess.